Welcome to our third, and final full reveal for Winter CHA. Thank you so much for the great response to our first two collections, French Kiss & Pretty In Pink! We are so excited that you love them so much, and think you are going to love Happy Travels just as much! 1. Leave a comment letting us know what your favorite part about "Happy Travels" is. Pretty easy, huh? If you haven't already, be sure to check out the Pretty In Pink full reveal post or the French Kiss full reveal post for a chance to win those entire collections as well! 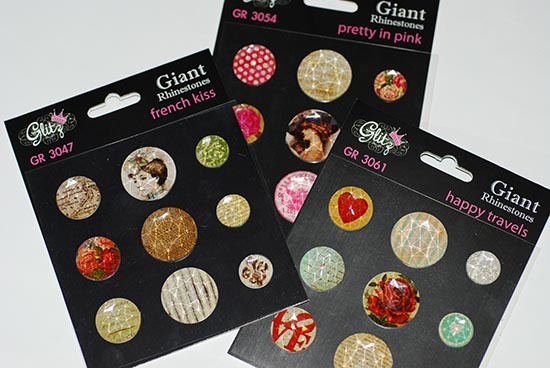 If you haven't participated in this month's Glitz Design Blog Challenge, we are also giving away some new product to one lucky participant! Be sure to check it out and play along if you have the chance! Remember, you can create any type of projects for our blog challenges!! You have until January 26th to link up your project!! We hope that you have really enjoyed seeing the full reveals of all three new Glitz Design collections! Be on the lookout for them in your favorite store soon!! Wow! I'm loving the aqua! Very vintage and different. So glad we are planning a vacation this year! Still showing the love on FB! I love the feel of this line. i like this line a lot! This is beautiful! I think my favorite is the cardstock title stickers!! I am still a facebook fan! Gorgeous collection!! One of my favorite travel collections ever! Love the stamps, peek-a-boos and paper layers! Great! love the colours in this range... did a big trip a year ago... this range will work well to put it all together. I have also shared on my facebook, and liked you too!!! It's masculine or travel to me. I love papers that work for my boys. this is my favorite collection of yours EVER! I love it all!!! TFS! I fell in love with that bicycle! I already "like' you on facebook! Wooo Hooo. . . Happy Travels - love it! I find Glitz designs so easy to work with. . . everything goes together so well and love the distressed, vintage look each and every piece has. . .Glitz is definitely one of my TOP 5! love the plane paper, the bicycle paper, and the adorable trunks ont he paper pages! Another great collection!!!! Love the Epoxy words!!! 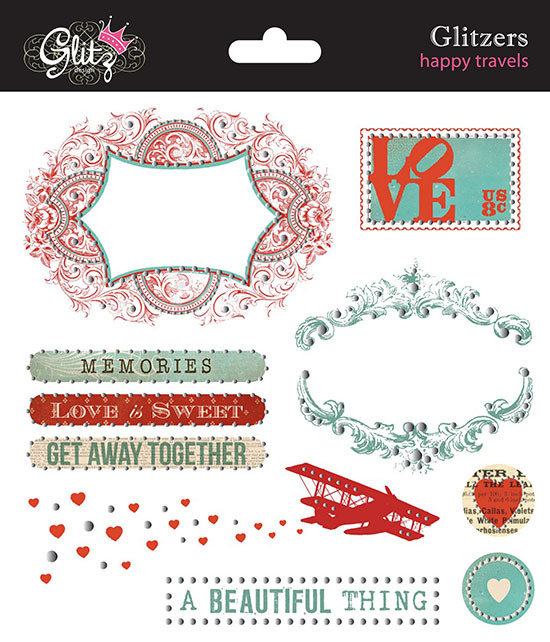 Love the papers and the stamps oooo got loads of ideas for these just love all the collection. I love the combination of aqua and red. Wow, I like it , I want first start with the page with bike! This collection makes me happy! That airplane paper is fabulous! Love the What Nots too! Just Liked you on Facebook too! Loving the sweet floral planes :). Already a Facebook fan. I LOVE this collection. The Giant Rhinestones really caught my eye. Love this one to and great for both my daughter and two sons. Love the colours to!!! This collection is to die for ... love the colour palette, and my favourite part of the collection are the use of those floral planes!!! tres chic! I already like you on facebook! it's more of a love actually! Those peak-a-boos look so exciting ! I LOVE LOVE the colors in this line!!!! great mix!!! This line is my fave! 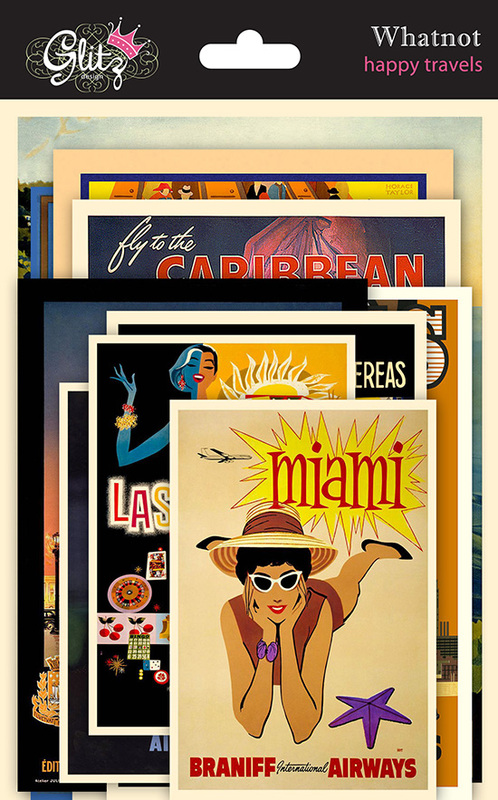 LOVE those mini vintage travel posters best!!! I have to have those stamps!!!! The whole collection is beautiful :). What a fantastic collection, there is so much to love, how can I pick just one thing? But...the suitcases with the "Love" balloons tied to them are AWESOME. Thanks for the chance to win. Love, love here and in Facebook!!!! Love the colour way of this range, rich and so versatile. Such a hard job picking a favourite as the papers are all lush but Happy Travel Titles really appeal. Love this new travel line! Simply gorgeous! I love the red and teal in this collection! Thanks so much for the chance to win! Love this one. I love the little airplane with heart exhaust clouds. Sweet! Love these colors, prints and bright but a bit vintage look! awesome collection! shared it with my FB friends! 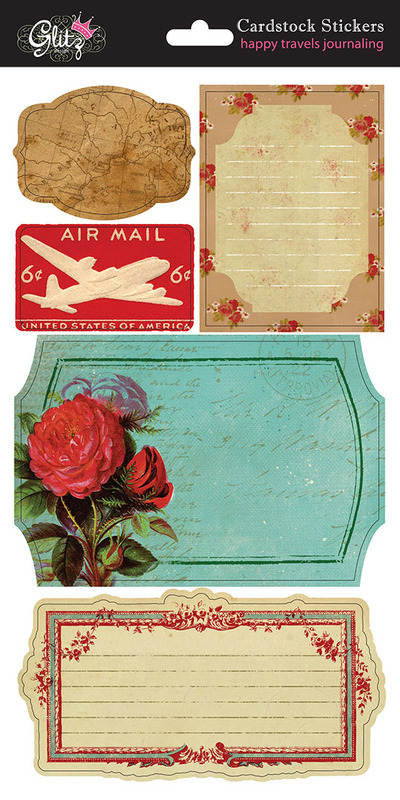 Love the vintage look go this collection and the stamps are so cute! Beautiful line! My favorite though is the airplane paper - too cute!! This is a gorgeous collection! Love it! I think the stamps are my #1 favorite! My Favorites are the glitzers and the paper layers! Oh my, I just love the colors. But my favorite would be the the patterned planes, they are so cute! I ma still loving you on FB! I love it all, my fave part is the papers! I already like Glitz on FB! I really like this collection. I think the colors are wonderful. I love the aqua! (Well I love it all!!) What a start of the new year! Oh, and yeas I like it on facebook of course! I love to travel- 50 countries seen, 150 more? to see- so this line is just perfect! I love papers and whatouts and paper layers- anything paper goes! Beautiful collection! The color scheme is vibrant and soft at the same time. It is not the same ole travel collection. The stamps are lovely. The roses add such charm to the line. I love the blue and red color. They contrast perfectly! Gorgeous designs....love it..oh the possibiliites! This collection is wonderful! I like the design paper with the bike! It is lovely! I also commented on your facebook wall! Wonderful job with this release! Wow, this is fabulous! Love the colours. I left a comment on Facebook and immediately LIKED your Facebook page! I adore your products and esp. 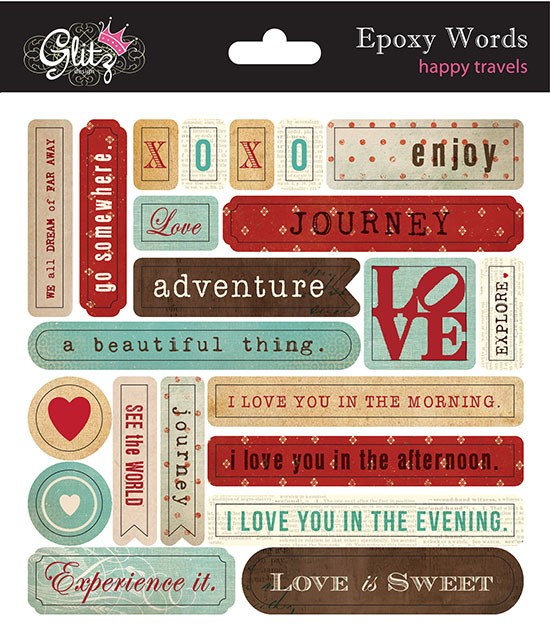 love this new Happy Travel line! Thank you so much for making such fabulous products for us to purchase and play with! 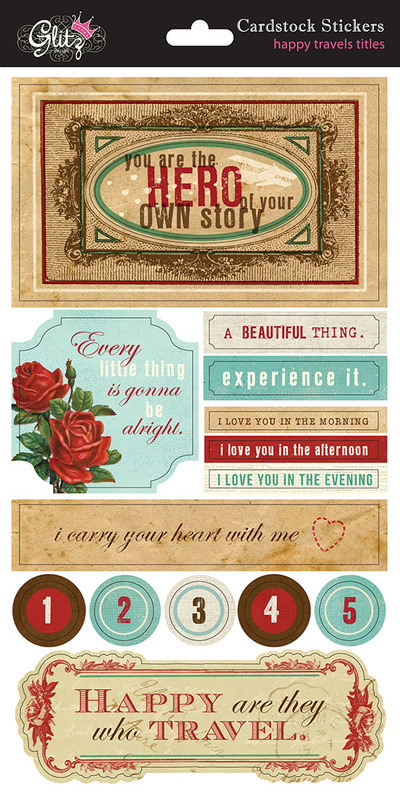 I LOVE how this line combines the shabby chic and vintage flair together in a travel theme. I don't think I have seen this kind of line before and I adore it! The papers and accessories are drop dead gorgeous as usual and they look like they will be fun to play with! I will have to have this whole line, esp. for my Hollywood Studio photos from Disney! 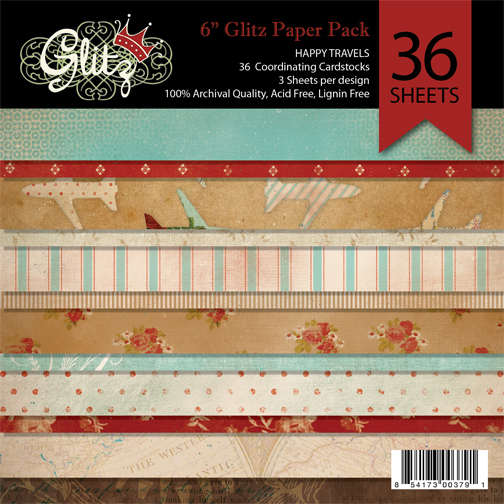 The perfect papers and embellishments for them! Awesome job, ladies! You rock!!! 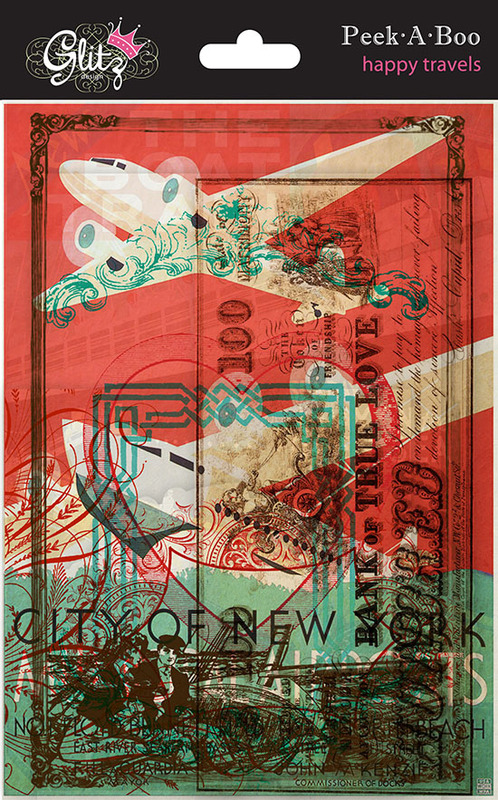 Love the airplanes and the colors in this collection! love the rhinestone stickers & the peek-a-boos!!! Love the rhinestones. Amazing line of paper. I love the vintage feel of this line!! I want those Whatnot cards!! 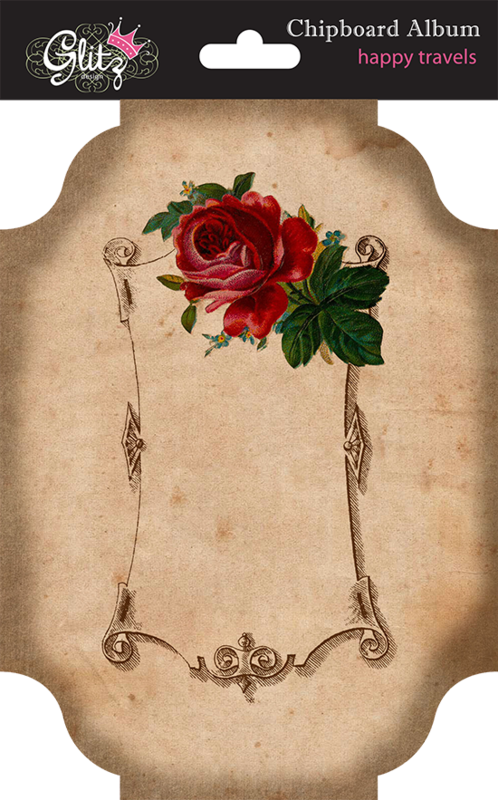 I have just had a request for a set of cards using something with this type of image - I'd love to get ahold of these!! I hope the LSSs are carrying them soon. Beautiful collection! It makes me want to take it to the sky, as they say!!! I especially love the colors and the chipboard album! Such a great travel line! Great patterns and I am loving the vintage vibe. So glad I found you... Now I just have to get my LSS to order your products! Wow! This is such a unique, beautiful collection. I love the juxtaposition of flowers and airplanes. I also LOVE the map stamp. Really cool. Really like this collection too. Doing a lot of traveling this year, this set will come in very handy. 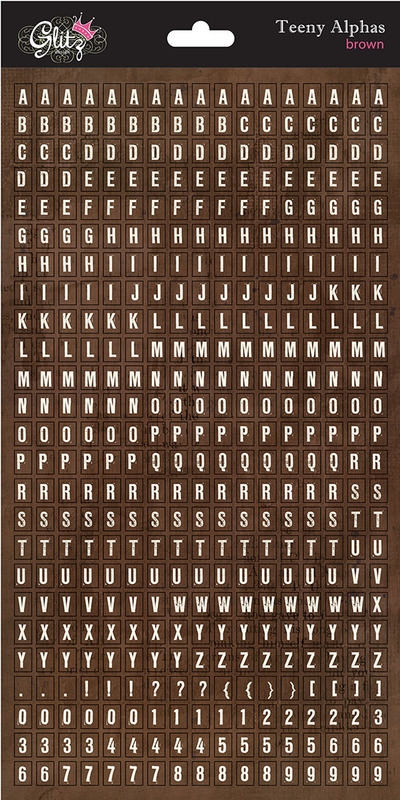 Really love the epoxy words! 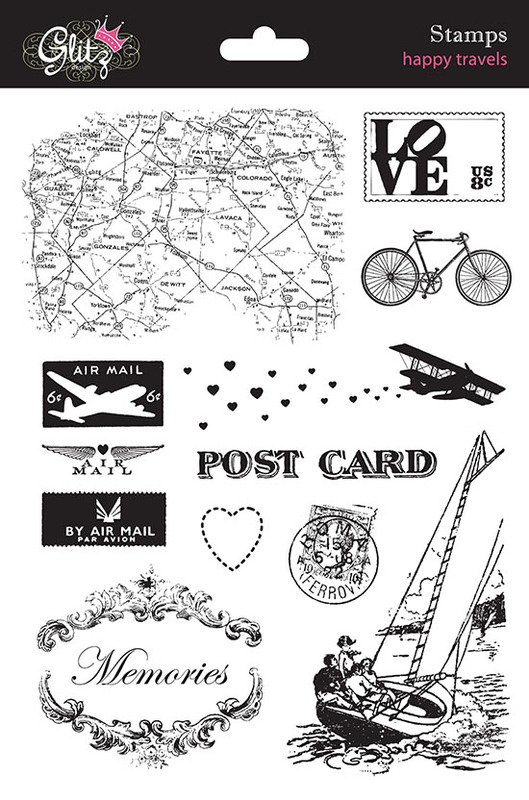 I am so in love with the Happy Travels collection, I adore the airplane paper and the old fashioned bicycle paper. Hi there, I also showed the love on Glitz FB page. Thanks for the chance to win! Love this new line!!!! I really like the colors and the designs of the paper! Wow! This set really has it all. . .pretty roses, the travel themes with the suitcases and airplanes. Plus those great maps/compass papers. Love those! This set is really versatile. LOOOVE this line!! It's definitely not "just" a travel line! Those colors and patterns are fantastically versatile! And, of course, I "like" (more like "love") you guys on Facebook, too!! 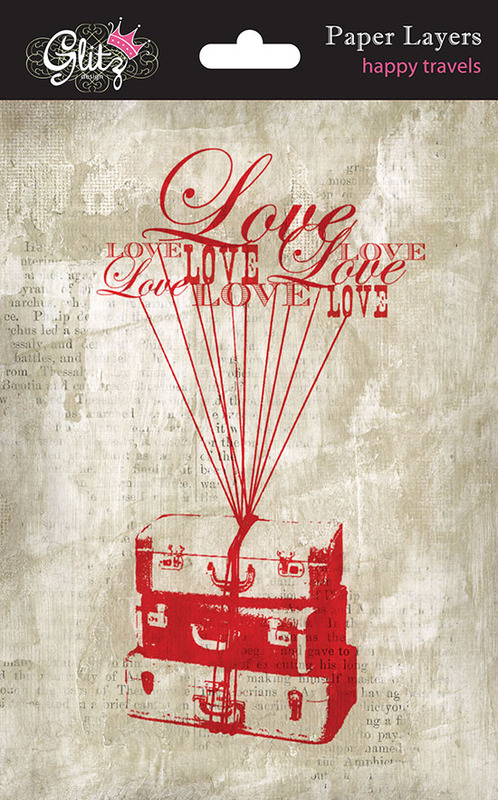 I think what caught my attention was the stack of suitcases floating from the hearts - SO many ways to use that image! The entire line is very versatile and would be great travel and/or masculine pages and cards! I have already LIKED Glitz on FB!! Always enjoy your posts! I've left a comment on your wall on FB and shared! B-E-A-U-T-I-F-U-L collection. My favourites are striped and dotted papers. The colors and designs are scrumptious.And since I'm from Miami-I got to have this one for sure. I like you on FB for sure. Beautiful collection. I especially like the epoxy words. Love this collection, gonna sound silly but it reminds me of vintage wallpaper and brings back childhood memories.....love the airplane paper!! 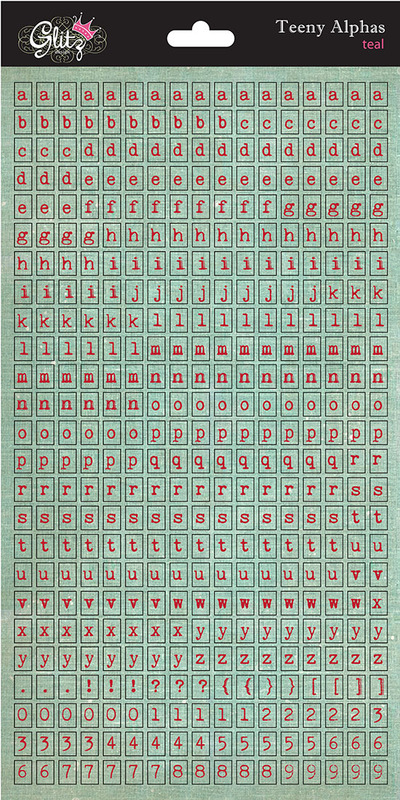 Love the stamps and the vintage/weathered look of the papers! How come there are so many beautiful designs!! It is almost the most creative blog, and helpful too. Now I know what to give my family for a present. Last year I travelled to Argentina for the holidays and got an apartment for rent in buenos aires. Near it there was a stationery store which sold all kind of things as cards and other stuff for presents. I bought a lot since I wanted to go back home with presents and cards in Spanish. They were so cute!